In this memoir-esque book by former U.S. vice president Joe Biden, Promise Me, Dad mostly revolves around details of Biden’s second term as vice president. Pieces of his earlier experiences and previous political movements are woven through his the story of his vice presidency and his struggle to determine if he should enter the 2016 presidential race. Whilst all of these major professional decisions are being made, Biden is also dealing with the failing health of his eldest son, Beau, which strongly influences which direction Biden chooses to pursue. Throughout the book, Biden sprinkles in many family-held truths of what makes you a good person and how the family depends on and lifts each other up. It left me yearning for the opportunity to have grown close to and been influenced by a family like the Bidens during my early years. Publication Date: 14 November 2017 by Flatiron Books. Format: Hardcover. This entry was posted in america, memoir, nonfiction, Review and tagged 2016 election, america, beau biden, book review, flatiron books, joe biden, macmillan, macmillan publishing, memoir, nonfiction, promise me dad, united states, vice president on March 31, 2019 by Bri with a book blog. I received Scaachi Koul’s debut in my great Christmas book haul of 2017 and I adored it! Koul is a news reporter at Buzzfeed and wrote an excellent essay about A Series of Unfortunate Events that put her on my radar (please read it here or this magnificent piece about Sufjan Stevens that I only found today if you want to get a taste of her style and the things that interest her). The point of view that shines through in her Buzzfeed essays is cranked up to 1000 in One Day We’ll All Be Dead and None of This Will Matter, a memoir of personal essays about the experiences she’s had so far. She sprinkles in some stories about growing up in Canada with Indian parents, going back to India and being othered because she’s “western”, but also not exactly fitting in within all western contexts either, a few college stories, and a gloss over adulthood and relationships. It was a quick read and gives a reader a glimpse into lots of different territories without wading in any of them too long. My favorite essay is titled “Aus-piss-ee-ous” and covers attending a cousin’s wedding ceremony in India and feeling out of place with the traditions and realizing that even her Indian relatives aren’t quite comfortable with the traditions either, but go along with it anyway. Koul’s book is excellent, very entertaining, and tonally felt like catching up with a friend over beers. I recommend! Publication Date: 7 March 2017 by Picador. Format: Paperback. This entry was posted in comedy, humor, memoir, nonfiction and tagged book, book bloggers, book review, books, buzzfeed, doubleday, doubleday publishing, macmillan, macmillan publishing, memoir, nonfiction, nonfiction essays, one day we'll all be dead and none of this will mater, personal essays, picador, scacchi koul on March 21, 2018 by Bri with a book blog. As a huge fan of both of Jeffrey Eugenides’s other published novels (The Virgin Suicides and Middlesex), I’m a little surprised it took me as long as it did to get to reading The Marriage Plot. Eugenides has such a brilliant way with stringing words together and slipping in poignant statements when you aren’t expecting to stumble across them. I was a bit nervous to listen to his latest story in audiobook format because I wasn’t sure if I’d be able to visualize how beautifully his words flow together in the same way that I was able to when electronically or physically reading his works. While I didn’t love The Marriage Plot as much as his other works, it was my favorite work of fiction that I’ve read so far in 2015. That’s not to say that it’s the best fiction work I’ve read this year — that would be The Curious Incident of the Dog in the Night-Time (review coming soon! ), but it’s definitely the fiction read that I’ve most enjoyed. A lot of other reviewers have been annoyed by this book because the main characters are all a bunch of pretentious college students, which they definitely are, but the novel highlights the pretentiousness without casting it in an admiring light. Frankly, most of the characters in the novel reminded me of people I stumbled across in my own college experience that were pretty pretentious in similar ways (the philosophy spouting Leonard, one of the three main characters, reminded me very specifically of one of my dearest friends, while also lampooning all of his faults that can irk me). which I feel like perfectly sums up Madeleine as a character. Of all the characters, Madeleine falls the flattest, but I feel like that’s intentionally done and is more of a purposeful statement than a fault of the writer. 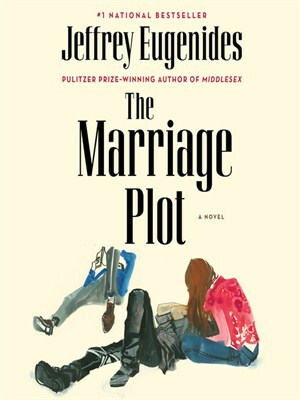 The novel is entitled The Marriage Plot because that is essentially the plot of the novel, something that Eugenides felt was missing in current literature when compared to the great Victorian novels, such as Pride and Prejudice. That said, I feel like the title is a bit misleading and could be discouraging to readers who don’t want to read about “marriage.” Yes, a marriage occurs within the pages of the books, but it’s more a story of how these three characters have interweaving lives than about any specific plot line. And finally, because I’ve stressed so much how Eugenides is incredibly gifted with his words, here’s a quote from The Marriage Plot that nearly made me shed a tear on the subway. Publication Date: October 2011 by Macmillan. Format: Digital Audiobook from Macmillan Audio. This entry was posted in audiobook, fiction, Review and tagged audiobook, audiobook review, book review, fiction, jeffrey eugenides, macmillan, macmillan audio, macmillan publishing, review, the marriage plot on May 17, 2015 by Bri with a book blog.